Home/News & Events/News/Dorset/Wave Project Dorset receive £148,000 in funding from the Big Lottery. The Wave Project has been handed a grant from the Big Lottery Fund to run its courses in Dorset for the next three years. 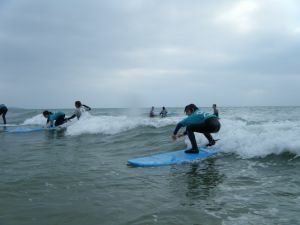 The project supports isolated young people in Dorset through a programme of surf therapy which aims to help them to feel more confident and less anxious. To date the charity has worked with more than 2,000 children across the UK and over 300 in Dorset. The £148,000 donation from The Big Lottery Fund will enable The Wave Project to support a further 180 children and young people in Dorset working with professional services. The charity also runs a surf club part funded by Dorset Healthcare NHS Trust. The project is based in Southbourne but offers courses to youngsters from across the county. Wave Project Dorset coordinator, Curt Marlow, said: “This is a really exciting opportunity because The Wave Project benefits so many young people in Dorset. Joe Taylor, Wave Project CEO, added: “We work with youngsters across the country who have physical disabilities, young carers in need of an outlet, children not currently engaging with school, and young people whose emotional wellbeing needs support.